Would you trust this thing with your luggage? The hotel won’t open until June, but the Yotel New York’s huge one-armed luggage robot is already stopping foot traffic. Visible from the sidewalk in a clean, all-white room is Yobot, the first-ever robotic hotel luggage handler. And it doesn’t even wait for a tip. The robot was one of many high-tech hotel features showcased Wednesday at a preopening launch at the hotel, located on W. 42nd St. and 10th Ave. three blocks west of Times Square. Yotel New York is the newest in the Yotel line of small and cozy accommodations, which includes the book-by-the-hour airport “pod” rooms at London’s Gatwick and Heathrow Airports and Amsterdam’s Schiphol Airport in the Netherlands. Yobot, a direct descendant of the robots working in automobile-assembly plants, deftly grabs, lifts and stores baskets containing luggage, much to the delight of sidewalk onlookers at its street-level window. 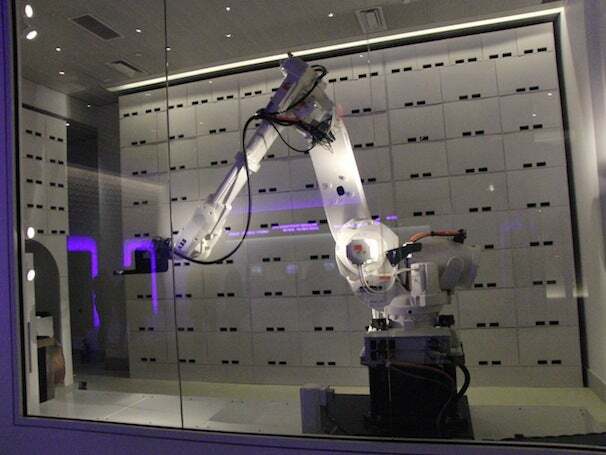 Guests needing to store luggage start Yobot with their room cards and then follow instructions on a video screen as the luggage hatchway opens and closes before Yobot goes to work. The large robot moves surprisingly smoothly for its size as it locates the proper drawer space for the luggage and puts it away. 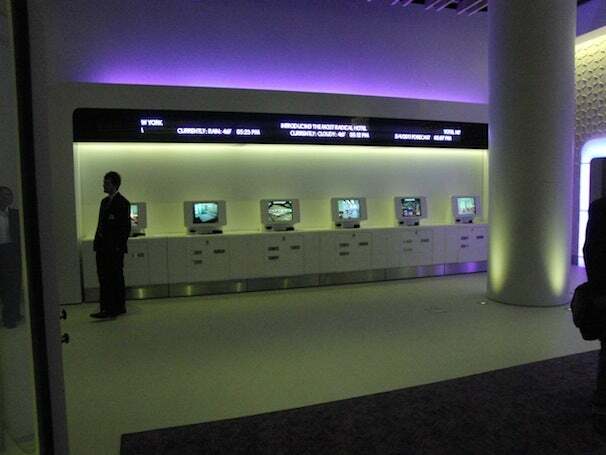 Aside from Yobot, the 669-room hotel is well-connected to cyberspace and offers a number of high-tech features. Guests enjoy free Wi-Fi in their rooms and all parts of the building. Each room has a bamboo snack tray that doubles as a lap table for laptops as well as a safe which can accommodate a laptop. Guests also get a limited number of free phone calls. Checking in? The Yotel lobby. The check-in process is automated. A battery of computer kiosks greets arriving guests, but human help is nearby if needed. The room cards use RFID technology--no sliding or swiping is needed, just a touch of the lock with the card. A small business center near the fourth-floor restaurants and bars offers free Internet access and printing. The key feature of the Yotel New York is the small, efficiently designed rooms--a concept that keeps the cost of the rooms down and maximizes profitability of the building, said Gerard Greene, CEO of London-based Yotel. For example, the 170-square-foot “Premium” cabins have an electrically controlled bed that gently slides between futon/couch position and the flat bed position in about a minute with the touch of a button. A 32-inch HDTV in one of the rooms. 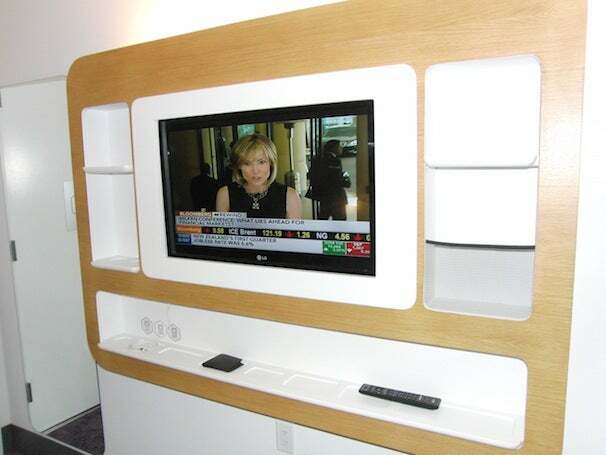 Below a wall-mounted 32-inch flat-screen HDTV is a narrow shelf with a dangling audio cord for iPods or other mobile electronic devices and shallow insets for keys, change and other small, loose items. Each floor has a kitchenette with a microwave oven, thus allowing late-night diners to shop at one of many 24-hour food and drug stores in the area. The hotel is accepting reservations for stays starting June 7. Hotel rates start at $149 per night, but prices can fluctuate greatly based on demand. Robert S. Anthony is a New York-based technology and travel writer and the author of The Paper PC technology and consumer electronics blog.